Coverage: Up to 1250 sq. ft.
Great humidifier. On low it runs exceptionally quiet. On high it takes care of my kitchen and family room and then cuts down to a slower speed by itself. Very easy to fill from the top, which is exactly why I bought it. You won't be disappointed. Definite benefits during winter for allergy suffers! Great small humidifier. I am using in a large great room with a high vaulted ceiling. I already can tell a difference, in just one week, with my allergies. Nice humidifier but runs noisy. There is a filter that fits in top over the fan that did not come with it. I have ordered it and hope that will cut down the noise considerably. Otherwise I really like it. 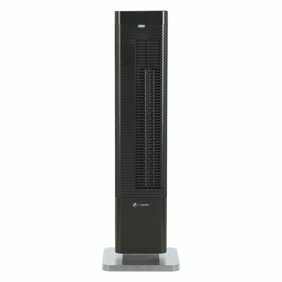 It has 4 fan speeds and numerous setting for the amount of humidity desired in the rooms. I like the automatic shut off feature when it reaches the desired humidity level. In conclusion, other than the noise, it is a nice humidifier. It works for putting moisture in the air however if you expect to feel it right away you will be disappointed as it takes a few days to notice the difference. It has several settings which I like. The product works very well. During a very cold spell while the heat was running heavily it had trouble keeping up but still kept the air moist enough to prevent static. Which made me very happy! This was bought because of my wife needing it. So far it works great. I'm able to do the whole apartment. We set it at 50 and have the fan on F1 so it only comes on when needed now. And the way it's set, I don't have to fill it too often. At first I did, but now that it's been working it's okay now. The last one of these 5D6700 humidifiers I had worked 5 seasons with nothing more than putting in a dash of bacteriostat treatment every time I filled up the water, replacing the filters twice a year, and putting a drop of 3-in-1 oil in the motor bearing every once in a while. I was really happy with it, despite having to spend $25 a year on filters and bacteriostat. Late last spring, it finally gave up the ghost, so I just bought another one this fall. The new one has: Better control over humidity (5% increments instead of 20% like the old one). Better sensitivity -- the humidistat is now in the cord assembly, instead of inside the enclosure. It's much better at sensing changes in humidity (like when the forced air heat goes on). Worse reliability. The 4-speed motor control on the fan died after a week of use. Now the humidistat still controls humidity, but it's either off or full speed power on (makes some difference to me if it's loud, might matter a lot to many). Since it's winter and I need it, I decided to just let it go rather than try for a replacement or repair. Worse value -- the Model 1050 inlet air filter which keeps the water from getting full of dust and crud used to be included, but is now an optional extra -- would have been nice if I'd known ahead of time, instead of finding out when I opened the box. Annoying. Just charge an extra few bucks, and give us something you can use properly right away. I'm hoping this one lasts as long as the last one. Somehow, though, I don't think it will. I wish it had a fill level, and, the price listed here is $10 cheaper than I was charged, so I would definitely recommend it for $60. Has 4 speeds for fan .First 2 are fairly quiet, the 3rd one is bearable, but the 4th one is super loud. Can't be in the same room because its disruptive! I have it taking care of 3 rooms definitely well under 1250 sq ft and set at 30 for moisture level and it can't keep up unless on the disruptive level 4. Not happy at all! Do not buy this if you want an efficient quiet humidfier!! Got it all set up, will not power on. Note in packing to call the manufacturer if there is an issue before contacting the seller. Their hours are my work hours.. 7 am -5:30, Sitting in my living room with water in it... bought on line because I don't have time to get to the store to return it.